These 5 day trips from Thessaloniki, Greece will surely please all nature lovers! Have a read below to find out which are the best road trips to take from Thessaloniki! Mount Olympus is the tallest and most famous mountain in Greece. Just less than 100 km from Thessaloniki, a day trip to Mount Olympus is definitely an experience you won’t forget. Nestled at the foot of the mountain, is the village of Litochoro where you can find several restaurants, bakeries, gift shops, an information center, and several hotels. If weather permits, I highly recommend taking a hike up the mountain. This beautiful mountain is home to over 1,700 species, including rare flowers, endangered birds, several waterfalls, and plenty of trekking routes to explore. There are about 20 different routes that you can take, ranging from 2 hours to 2 days, found here. My favorite route was from Prionia to Agios Dionysios Monastery. This is quite an enjoyable route as it is only 6 km. After arriving at Prionia by car, head down the E4 path towards Litochoro. Along the way, be sure to check out Enipea waterfalls before reaching the Monastery. Reward yourself for your hard effort by enjoying a nice dinner back at Litochoro. The lovely city of Kastoria is just a two-hour drive from Thessaloniki. With its beautiful surrounding landscape, and breathtaking lake, Kastoria is a favorite among autumn and winter lovers. 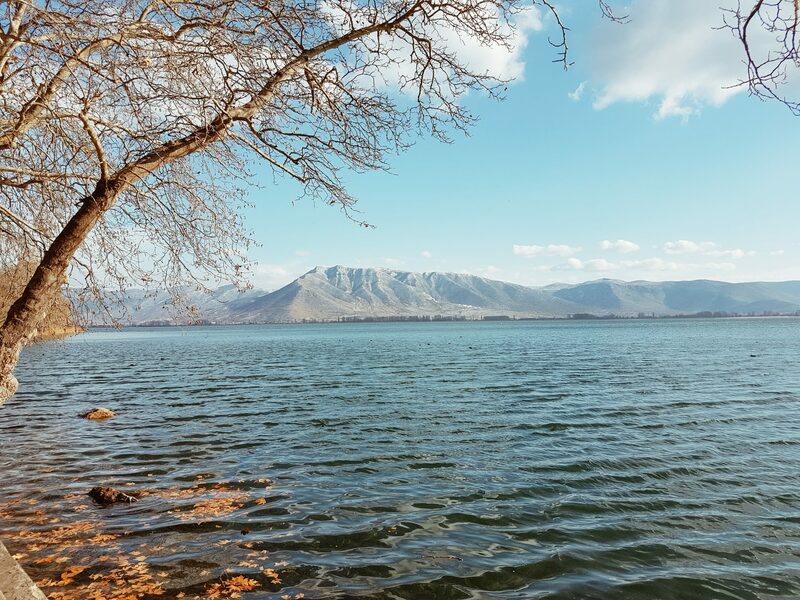 Once you arrive at Kastoria, be sure to take a walk around Lake Orestiada starting from the side nearest to the town. If you are lucky enough you will notice swans and other beautiful species in or near the lake. Further down the path you will come across Dragon’s Cave, where you can observe seven underground lakes and rooms. Legend has it, that the cave used to be home to a dragon! For a overview of the city, follow the path towards Profitis Ilias Church and continue until the lookout point. Once you find your way back down to the city, make a quick stop at the Folklore Museum of Kastoria to learn more about this historic destination. Finally, end your trip by enjoying your dinner at one of the fine restaurants along the lake. Naoussa is a small city just a little over an hour drive from Thessaloniki. While the city itself is worth exploring, I highly recommend taking the 2 km road to St. Nicholas Grove. This majestic park features the church of Saint Nicholas, several rivers, small lakes with ducks to feed, basketball courts, tennis courts and a volley ball court, a playground, shops to buy locally made products and souvenirs and lastly, several hotels, taverns and cafes. Saint Nicholas Park is worth visiting all year around: during the fall you’ll enjoy the different vibrate colored leaves, during the winter the endless snowball fights, during the spring the countless flowers and butterflies and during the summer the nice cool atmosphere. Take your dog, picnic basket, kids, books, or whatever you need to enjoy a long and relaxing day at the park. Edessa is about an hour and a half drive from Thessaloniki. If time permits, I recommend first visiting Naoussa since it is just a small detour from your course and then finishing your trip at Edessa. The city of Edessa is filled with little bridges that all eventually lead to one of the biggest waterfalls in Greece. Starting from the top there are several look points that guide you to the big waterfall. Let the sound of the water lead you down the pathway where you will find the picturesque waterfall that overlooks down into a valley of green fields and flowerbeds. Be sure to walk behind the water curtain to find the hidden cave. Then, walk down the cobblestoned path where the water hits the rocks creating a double waterfall also known as Lamda falls which lead to two water pools. After exploring the waterfall and its surrounding landscape, make a visit to the Open Air Water Museum followed by a walk down the historic neighborhood of Varosi. Skra is one of nature’s hidden gems here in Greece that even many Greeks have never heard of or visited. Located just off the outskirts of Kilkis near the northern border of Greece, Skra is a natural park consisting of several waterfalls and pathways worth exploring. To get to Skra, take the road towards Aksioupoli and from there continue towards the towns of Koupa and Fanos. Then, continue following the signs that lead towards “Katarraktes” (waterfalls). Once you arrive, leave your car at the parking lot and follow the stone pathway that leads down to the park and eventually to the waterfalls. The lake found in this natural treasure is made up of crystal turquoise waters and is surrounded by tall forest trees. Although the water is freezing during the fall and winter months, make sure to come back during the summer months to take a dip in a unforgettable natural pool. You can read more travel guides here!